Gyalwang Karmapa continued the section in the text on the theme of death and impermanence, the second contemplation of the four common preliminaries. Today’s transmission began with a powerful evocation of the moment of death. Death is inevitable and cannot be escaped, however wealthy or powerful we are. Life is short and the time of death is uncertain, what can we have confidence in? Only the Dharma. The text continues with various meditations on death and impermanence, followed by examples from different Buddhist texts and namthar which reinforce this view. Life is like people meeting at a weekly market; the next day everyone is gone. The only thing which will accompany us at death is the Dharma. Thus we need to supplicate the Gurus, be diligent in our dharma practice, and devote our lives to virtue, as a matter of urgency. A story from the life of the 11th century Kadampa master and meditator, Kharak Gomchung, provides an example of the attitude a dharma practitioner should adopt. Kharakpa gave many teachings on how to overcome attachment to mundane concerns, and he himself was renowned for his renunciation. Once a tea merchant came to Kharakpa’s cave and left an offering of a brick of tea. Three years later the merchant returned to make another offering, but he found the first brick of tea untouched and gathering dust. Puzzled, he asked the meditator why he had not used the tea and Kharakpa replied, “I didn’t know whether I would boil the tea or the tea would boil me, and so I had no time! Take them both and go!” So the merchant picked up the two bricks of tea and left. Such is the urgency he felt of dharma practice. Supplicating the Gurus we ask them to bless us so that we are free of fixation on this life, bless us that we are spared from the rod of having no time, and bless us that our practice is meaningful. We have to get our priorities right and practise the Dharma correctly, because we might die at any time. The Gyalwang Karmapa then reviewed and commented on the text. First there are meditations from the sutras, then from the great Indian masters of the past, such as Nagarjuna and Shantideva. Finally, there are examples from the lives of the great Tibetan masters. Nagarjuna in his Letter to a Friend says that it is a wonder that we do not die between the breath in and the breath out. The Karmapa expanded on this idea. When we stop breathing, we die, he said. Turn off a person’s life support machine, and they die. We take breathing for granted, breathing in and out, day after day, year after year, and we forget how amazing it is. Even one single breath is based on thousands of steps and on many other factors such as the plants which make the oxygen we need. If we had to buy the air we breathe, we wouldn’t be able to afford it. We might think we do not have much, but when we consider it, to be able to breathe is a great fortune. In The String of Jewels, Nagarjuna writes that there are few causes of life yet many causes of death, and even the causes of life can become causes of death. For that reason we need to practise virtue because only the Dharma will help us at the time of death. In The Way of the Bodhisattva, Shantideva writes that at the time of death we have to bear the consequences of our karma. We cannot share the consequences of our actions with friends or relatives. Our own happiness depends upon ourselves, but we make the serious mistake of forgetting that the negative karma created by our own misdeeds will ripen upon us. Lifetime after lifetime, our karma has thrust us into the prison of samsara. Turning then to the lives of the Tibetan masters, His Holiness told one of the stories about Geshe Tönpa. Once upon a time, Geshe Tönpa saw someone circumambulating a stupa. “I’m practising the Dharma,” the man replied. The man was puzzled, so he stopped doing circumambulation and thought hard about what true Dharma might be. Finally, he decided it must be reading the scriptures, so he began to read the scriptures instead. Along came Geshe Tönpa, saw him reading and said, “Reading the scriptures is very, very good, but even better is practising true Dharma.” Once more the man was confused. He thought and thought and finally decided he should practise meditation, that must be true Dharma. So he sat down in meditation posture and began meditating. “I’m practising true Dharma,” the man replied confidently. You have to have both revulsion and diligence, His Holiness explained. If you do not give up on this life, whatever you do becomes a worldly concern. There are two stories about Geshe Potawa, Geshe Tönga’s main disciple. He would teach two sessions of the Dharma, in the morning and in the evening. After his evening teaching he would say to his students, “If we do not die tonight we will continue the Dharma teachings tomorrow, but we don’t know what will happen tonight.” Geshe Potawa was so aware of the urgency of Dharma practice that he refused to repair a crooked pillar in his house. “There’s no need to change the pillar. Who knows whether we might die before we finish repairing it,” he said. 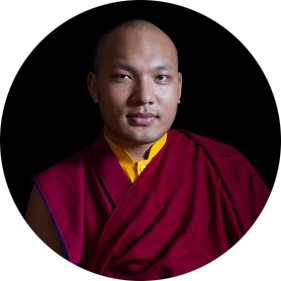 If we want to die without regret, the Dharma has to be practised today, right now, the Karmapa urged those listening. Kharak Gomchung realised this. He had no time to make tea because he was aware that he could die at any time. These great masters had realised impermanence, and we need to follow their example, but, instead, we foolishly prioritise the wrong things. 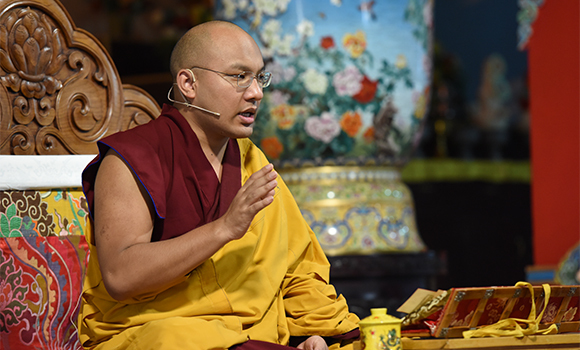 Counting them off on his fingers, the Karmapa enumerated our mistaken perceptions of what is important. We have clothes to wear but that is not enough, we want the best clothes. We have food to eat, but that is not enough, we want the most delicious food. We have water to drink or juice or whatever, but that alone is not enough. In Tibet we drink tea, he said, but ordinary tea isn’t enough, we need to have the oldest, most matured tea! Such thoughts indicate that we have not realised impermanence in our beings. The Kadampa suggest we think of each day as an entire life. When we get up it is like being born from our mother’s womb. When we wash our face we think that we are being washed after birth. When we take breakfast, we think we are drinking milk at our mother’s breast, and so we continue through the day. We do our studies and our practice, then in the evening when we go to bed, we think that we are about to die. Thus we view a single day as an entire life. If we practice like that, day by day, not wasting one day, we will not waste our lives. We must not waste a single instant. This precious human life, this precious human body, demands that we have a great aim, and accomplish great things. If we postpone things, they may never happen. His Holiness explained the meaning of the term Collected Topics [it collects the meaning of all the words of the Buddhas and scholars], and gave a short history of Collected Topics and its importance in the monastic curriculum. Last year, there was a short forty-minute debate and discussion on whether the shentong view was a true view or not. This year, on 12th December, there will be a Western style debate on two topics. The first is whether the shentong view is a true view or not. The second topic will be on which is more important, scripture or practice. There will be a group supporting and a group opposing. As this is Western style, someone will have to take the opposing side, His Holiness explained. There will be a secret prize for the winners. Clarifying the difference in style between Tibetan debate and Western debate, His Holiness reassured the monks that if the opponent of the ‘shentong view is a true view’ were to win, it did not mean that the shentong view is a false view. It would just mean that the debater was the best debater!